Congratulations to follower 'Carol El' the winner of Ascending Butterfly's October Book Club of the Month Title! 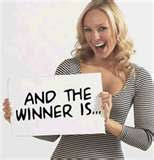 Carol won an autographed copy of 'America Libre' by Raul Ramos, join me in congratulating Carol here. *Remember, there is still time to win the necklace with BUTTERFLY cz Pendant Giveaway! Stay tuned for November's Book Club, there is a special surprise in store! !